Farm Fresh Feasts: Grill the farm share vegetables. It's what's for dinner. 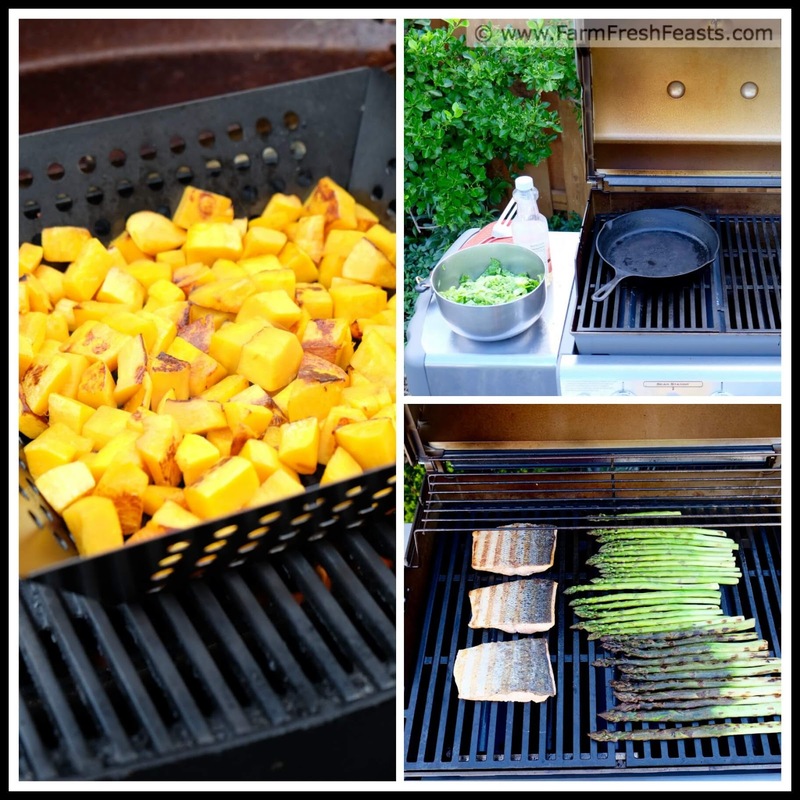 Grill the farm share vegetables. It's what's for dinner. Got a lot of vegetables in the crisper? Next farm share due soon? Throw the veggies on the grill. If I'm unsure what to have for dinner, I'll start with what vegetables are on hand. One of the lovely benefits of participating in a Community Supported Agriculture (CSA) farm share is that we always have vegetables on hand. In the Fall/winter, that means I gather vegetables from the Strategic Winter Squash Reserve in the basement, turn on the oven, then start peeling and chopping while I figure out what will go alongside a pan of roasted vegetables. Examples of a Roasted Farm Share Dinner and Roasted Potatoes with Squash and Peppers are two recipes I've shared using this technique. In the summer, I swap out roasting in the oven for throwing the farm share on the grill. I use the same preparation as if I'm roasting, and the results are equally flavorful. 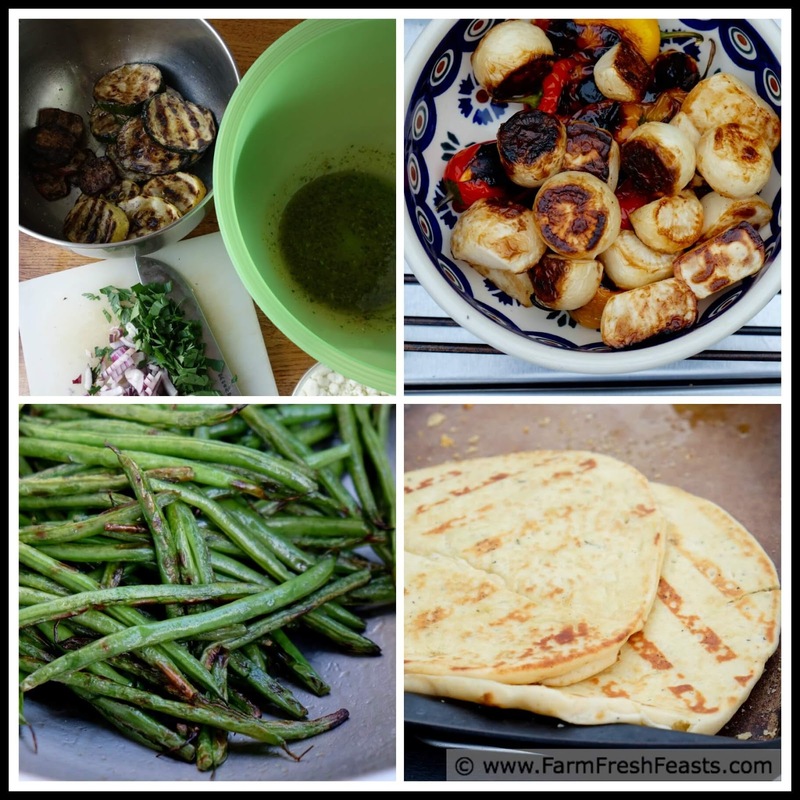 Examples of grilled vegetable recipes I've shared on the blog are Grilled Garlic Scape Pesto Smashed Potatoes, Grilled Green Beans, Grilled Mushrooms, and Grilled Butternut Squash and Peppers. There's no limit to what you can grill. In addition to the usual suspects above, I've grilled Bok Choy, Kohlrabi leaves, and Napa Cabbage. I've grilled naan bread for pizzas. I've grilled pineapple for pasta salad and next week I'll be sharing a recipe for Grilled Cherry Muffins. Grilled vegetables can be used as is, or put up for later meals by freezing. I use grilled vegetables in salads, spaghetti sauce, lasagna, and on pizza. I'll toss them with pasta served in both warm and cold preparations. Having a pile of mixed grilled vegetables is an excellent building block in your What To Eat For Dinner arsenal. I have no official recipe, just a technique. I try and make the pieces as uniform in size as possible. I toss them with cooking oil (vegetable or olive) and sprinkle with salt and pepper. I've got a basket and a perforated pan for vegetables that are too small to lay across the grill grates. Typically I've got the grill set at medium heat and covered during grilling. After about 5 minutes I'll check on the vegetables and flip or stir them. Small items in a basket, like peppers and cubes of squash, will get multiple stirs. Larger pieces like eggplant and zucchini will only get turned once. After the vegetables are tender, browned, and/or crisp I'll toss them with additional flavors. I really enjoy a dressing made from Garlic Scape Pesto thinned with olive oil. Depending on the eventual use of the vegetables, tossing the grilled vegetables with soy sauce or balsamic vinegar adds an additional layer of flavor over the salt and pepper. If you've got a grill, try throwing the farm share on it this summer! You are a grilling machine. I really ought to do more veggies on the grill. Perhaps this is my year. Time will tell.